In the 1830s the Literary and Scientific Institute met in the Agricultural Hall, what is now the Museum. The Library had no permanent home and moved between several buildings. It was a collection of books donated or purchased by the members of the Literary and Scientific Institution and was moved from house to house. 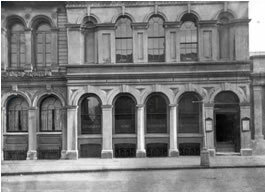 The building shown on the right was owned by the Gibson family and was later demolished to make way for their bank, now Barclay's Bank. The outside of the Town Library in about 1890. 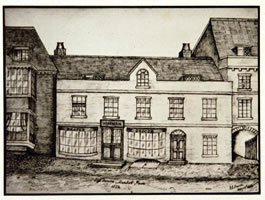 Picture of a building in Market Place, one of the first buildings used by the Institution, (from a drawing of Wiseman’s drapery and grocery shop made by Frank E. Emson). The Library has occupied its present building in King Street, Saffron Walden, since 1853. At first the Society were tenants of local Quaker benefactor G.S. Gibson.